The Konkani language is spoken along the Western coastal land of Arabian Sea. There, we come across varieties in spoken structure of the Konkani. Obviously, all that is being written in these varieties could have been termed as Konkani literature. Regretfully, one has to mention here that due to political ambient – surrounding – a large number of Konkani speakers cannot embrace the Konkani language officially, which has been included in the eighth schedule of Constitution of India and which is the state language of Goa. Karmelin, by Shri Damodar Mauzo. Today, when we say about literary language of the Konkani, then we have to consider the literature produced in Kannada, Malayalam, Devanagari and Roman scripts, which is spread in the states of Karnataka, Kerala, Goa and Maharashtra. I am not aware of any other fact about such a language, which has as many as four scripts that are being adopted at various places for reading, writing and publishing valuable literary books in a quite large number. Literature in this, which is one of the most beautiful languages in India, can be viewed in sequence of the concepts ‘modern’ and ‘modernity’. ‘Modern’ is the concept, which relates to the specific times, which identifies to latest style of life. It may also be defined as “contemporary or characteristic of the present moment in time” or “modern is applied to writing marked by a strong and conscious break with tradition”. The term ‘Modernity’ indicates to the values based on rationalization of thoughts. It is believed that the modern sociological thought begun with Ibn Khaldun, an Arab sociologist from North Africa. His Muqaddimah was written in 1377. Modernity is a term that refers to the modern era. It is indeed distinct from modernism; this term is viewed in different contexts viz. cultural and intellectual movements of between 1630 and 1940. Modernity is a term, which also indicates to the universal values of life accepted in modern era. One may hold an opinion that the process of modernity ended in last phase of the 20th century. It is replaced by values of post-modernism. One might stretch the concept of modernity “to cover the developments denoted by post-modernism and into the present”. Well, on this backdrop modern period of the Konkani literature could have been viewed simultaneously in terms of advent of values of modernity as well. If this view-point is accepted then the day of liberation of Goa on December 19, 1961, from the 450 year colonial oppressive rule of Portuguese regime can be said as the beginning of modern period and modernity in the Konkani literature. Late Dayanand Bandodkar, the first Chief Minister of the then Goa, Daman and Diu, (which was union territory in the Union of India) and his able lieutenant late V. S. S. Karmali, who was Education Minister of the government, opened primary and secondary schools at every nook and corner in the newly liberated part of Goa. This enhanced literacy among the peasants and other working class. Generation after that educational upheaval offered a special flavor to Konkani literature. Update: Since Dr Tadkodkar's presentation of this paper, Shri Kelekar has been awarded the prestigious Jnyanpeetth Award. The much honoured writers in Konkani today are Padmabhushan Ravindra Rajaram Kelekar, A. N. Mahambro, Damodar Mauzo, Chandrakant Kenny, Hema Naik, Mahabaleshwar Sail, Ramesh Veluskar, Madhav Borkar, Edwin D’Souza, Devidas Kadam, Dilip Borkar, N. Shivadas, Sheela Kolambkar, Meena Kakodkar, Gajanan Joag and others. Among the research scholars are Suresh Amonkar, Harischandra Nagvenkar, Mrs. Priyadarshini Tadkodkar, Dr. Kiran Budkulay, Dr. Ram Bhat, Dr. Maria Aurora Couto, Dr. Madhavi Sardessai and others. Other renowned writers are Prakash Thali, Dr. Prakash Vazarikar, Prakash Parienkar, Dr. Jayanti Nayak and others. I also should make a special mention of periodicals in Konkani. They relentlessly assisted the litterateur folk representing Konkani language and literature. Some of the names are ‘Rutu’, ‘Jaag’, ‘Kullagar’, ‘Konkani’, ‘Konkan Times’, Sunaparant, Vavraddeancho Ixtt (Roman-script Konkani, weekly), Gulab, Bimb . It is very difficult to embrace all genre of Konkani literature, in such petit note. As such today, I will try to focus only on the Konkani poets and their sensibility in view of the modernity. But, one thing should be made amply clear that when we make mention about certain Konkani literature, which belongs to modern period, some historians do not hesitate to mention Ligorio da Costa, Carlos Trinidad Dias and Arnold Menezes, who were the early Mando (a semi-literary folk song) composers of the 19th century and also Smt. Kamalamal, Narahari Prabhu, Suhas Dalal and Manjeshwari Govind Pai, who wrote devotional poetry during the late 20th century. Konkani poetry began shedding its traditional skin after Kashinath Shridhar Nayak (1899-1983, whose pen-name was ‘Bayabhau’.). His ‘Saddyaavelim Fulam’ (1946) opened the doors for those who longed to break the shackles of traditional mode of writing. He is therefore known as the pioneer of Konkani modern poetry. Another attempt of shedding anxiety of influence is seen in the ‘Painzonnam’ (1960) of Padmashree Bakibab Borkar (1910-84), and so also Manohar Sardessai for the concept traditional exhibition of love and philosophical, introspectional trance, still remained at the core. Basically, he and his contemporary Pandurang Bhangui, Shankar Ramani (1923-2004) represent the poetic genre of the entire classical romanticism in the Konkani poetry. Traditional patriotism i. e. love for country cannot be shed for it is omnipotent. It presents glimpses of anxiety of influence, in the poetry of Manohar Sardessai (‘Gomya Tuzya Mogakhatir’). Waman Sardessai (1923-94, pen name ‘Abhijit’) was a freedom fighter. He said, “Silent is my sorrow like nameless wild flower in forest” This element, indeed, represented the contemporary Konkani poetry. In this note, I have attempted to present, through a bird’s eye view, the glimpses of modernity in the Konkani literature today. 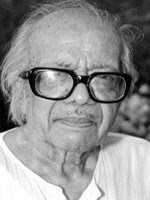 Sociological thought, which is omnipotent in the modernity, is distinctly visible in the poetry written by Padmashree Raghunath Vishnu Pandit (1917-1990). Pandit gave a war cry against social injustice and inequality, hegemony and hypocrisy. He, apparently, was the torch-bearer of this era from 1963. Earlier, stray instances did take place, which may have links with sociological thought, e. g. a poem by Adeodoto Barreto (1905-37). He addresses laborer class in 1937 in his poem ‘Bekaryanc’. He also longs for liberation of Goa from Portuguese rule and unification with India. His dream came true in 1961. But the spurt for sociological thought in Konkani poetry is seen only after 1963. Manohar Sardessai rightly said once that Pandit’s poetry is rooted in the Goan soil. His poetry brought in rustic language. Pandit was followed by a rich generation of poets, which indeed brought the genuine touch of modernity. The first among them is Nagesh Karmali. Pandit did not foresee a classless society, but Karmali did and advocated for it. He opposed the measures, which are repressive in character. He adhered to force revolts and revolutions. This was only the medium for the creation of a free and democratic classless society, at least in theory. The transition from feudal institutions to modern institutions was marked by a series of revolutions, reference of which is found in the Karmali’s poetry. Another tall descendant of Pandit is Pundalik Narayan Nayak. His ‘Bangarbaeel’ (the bull, which is not castrated) is the perfect and ultimate product of tyranny. As such, he appears to be oppressive. He would not listen to injustice and would surge ahead with might. Pundalik’s poetry worships equality and comradeship, but he is not canonically a communist. His, the then, poetry did not believe in popular democracy, but his plays have trust in it. While Pandit’s poetry brought in rustic language, Pundalik’s poetry nourished classical brutality. It is its forte. But even his staunch critic will not deny that Pundalik’s poetry is brutally honest. I strongly feel that his poetry destroys the unpleasant but uncanny, weird and necessities of the times in which he lived. Vijayabai Sarmalkar did ask about woman’s stature in the then social matrix. But her voice does not appear to be dominating. To fill in the gap of strong voice of a woman, some of poetesses viz. Hema Nayak, Nutan Sakhardande, Shakuntala Arsekar, Jayanti Nayak, Prashanti Talponkar, Shanti Tendulkar, Maya Kharangate, Neela Telang ventured upon social inequality. Some of them are romantic feminists. Rather the number of female litterateur exceeds the male writers in Konkani literature as far as impact of modernity is concerned. Glaring point of ‘modernity’ is that it postulates encouragement of advance or progress in useful sciences and arts. Surprisingly enough, Konkani poetry does not glorify this aspect of modernity. Especially, another modernist poet Prakash Padgaonkar does not have any admiration for ‘rapid, unplanned and senseless industrialization.’ This poet is a romantic modernist. Universally, sensibility about human agony lies beneath the essence of modernity. This is evident in the poetry of Padgaonkar. While Shivanand Tendulkar, Arun Sakhardande, Su. Ma. Tadkod (pen name of Dr. S. M. Tadkodkar) have ardent faith on approach to the modernity, the other glaring names are of Sudesh Lotlikar, Jess Fernandes. Apparently, they do believe as the American Christian fundamentalists still agree with Martin Luther who recognized that "Reason is the greatest enemy that faith has; it struggles against the divine word, treating with contempt all that emanates from God." Tendulkar (pen name – Kashinath Shamba Lolienkar) represents the vein of radical existentialism in Konkani writing. He believes in this context that man defines himself. Though this belief has a part of philosophical bearing, it indicates the presence of tenets of modernity. Neelba Khandekar could have been one of the fore-runners as far as the concept of modernity is concerned. A strong germ of modernity exists in his poetry but it slips in the realm of radical existentialism. Rajay Pawar could have been another descendant of Pandit, Karmali and Pundalik Nayak. Surprisingly, it is apparent that, the commitment vanished in course of time. One cannot disagree that people have begun in believing that modernist shop has global implications. Reason is being searched to comprehend this failure. The approach, which is in the name of sociological thought under the pretext of humanism, has come under various scanners. Modernism is a flaw, corrupt in the name of modernism and humanist tradition and has played itself out and is now floundering and directionless. If Modernism is at an end, we are now facing a new period. The name given to this new period is Postmodernism. But this viewpoint or commitment is not imbibed as yet in the Konkani poetry. But poets write for joy. An attempt of shedding anxiety of influence is not seen for the concept traditional exhibition of love and philosophical, introspectional trance, still remained at the core. Uday Bhembro, Ghanekar Bhicajee, Tomazinho Cardozo, (1941), Yusuf A. Sheikh, Gajanan Raikar, Sharatchndra Shenoy, Ram Prabhu-Choddanekar, R. Ramnath, Dattakumar Vyankatesh Kamat, Paresh Narendra Kamat, Shashikant Punaji, Gulab Vernekar, Guadulup Dias and others, Suresh Borkar are the core romanticists of Konkani poetry. Yusuf Sheikh says, “In these entangled threads there are knots, and many minds are entangled in these knots.” Suresh Borkar says, “What does my life lack? Receiving is joy. Giving is joy. Cup of my life is full of happiness.” Both these poets represent the poetic genre of the entire classical romanticism in the Konkani poetry.